Whatever else you say about Glasgow Warriors you have to admire their timing. The rain was coming in sideways at Scotstoun as Gregor Townsend’s squad stepped on to the bus at the start of a journey that would land them in Italy for a week. It may sound like an idyllic spring break but Glasgow travel in search of points towards that play-off place with the top of the Pro12 ladder becoming increasingly congested. Glasgow currently lie in sixth place and, while they have a game in hand, they can’t afford any more slip-ups, with eight points from the next two Italian matches the minimum expected return. They play Treviso this afternoon before fronting up just six days later against Zebre and the coach explained that there wasn’t much point in schlepping back and forth to Glasgow when they could train in Italy’s spring sunshine. “It was a bonus when we realised that playing the Zebre game six days after Treviso meant we could take a bigger squad out,” said Townsend who heads a 35-strong playing squad. “We don’t have to have an extra two flights – getting to Parma is quite tough – flying to two different venues. It’s much easier just flying to Venice, so it’s a bonus. “We talked about this the last couple of seasons, after the Six Nations can we get away for some warm weather training? We usually have a bit of time off at the end of the Six Nations and we have been able to do this just with these fixtures both being in Italy. Townsend has selected a strong XV to start this evening’s match against a team that came close to muscling their way to an unexpected win at Scotstoun earlier in the year. Glasgow needed a late try from Adam Ashe to eke out a 13-6 victory against Treviso in round eight and the same man starts at eight today, part of a chunky breakaway unit with Josh Strauss at six and Italian international Simone Favaro getting the openside berth. Wingers Taqele Naiyaravoro and Sean Lamont add some bulk to the back division. Henry Pyrgos and Finn Russell are Townsend’s first-choice halfbacks, with Tim Swinson partnering Jonny Gray in the second row. “The weather was slightly different [that day],” Townsend said about that near miss. “It was a wet ball and they played smarter rugby. We couldn’t get the ball off them. There were a lot of pick-and-goes. “We made a couple of mistakes when we had possession close to their line, so we didn’t build on some of the good work but we showed enough character to get the win. They are a tough team. They are big, they are very big, probably the biggest pack we will play against in the Pro12. Scotland stars Tommy Seymour and Alex Dunbar sit this one out, with Leone Nakarawa starting on the bench. Townsend hinted that other high-profile players such as Stuart Hogg would get a rest next weekend ensuring that all the big guns are in prime condition for what looks like a tough run in. 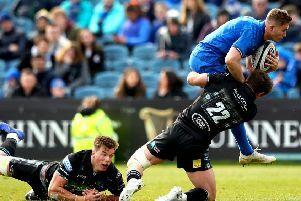 Glasgow must travel to the Scarlets and Connacht in two of the last three weekends and Townsend won’t want to fetch up in Galway on the final Saturday of the season needing a win to keep their season alive.